back home » webtutorials » HTML Basic Syntax. Learn the HTML basic Syntax, how to construct elements within, and how to use the parents, children, and siblings principle. The next line should be the <head> which will contain <title>Your Page Title</title> and ends with </head>. Learn more about how to place contents within head tags here. After the head's opening and closing tags, follows the opening <body> tag which will be followed with the rest of required elements and their contents, and then ends with its closing </body> tag. NOTE: Some browsers support HTML tags with uppercase but all browsers support HTML tags with lowercase. Take my advice and use the lowercase for your HTML tags to avoid unexpected results or errors. 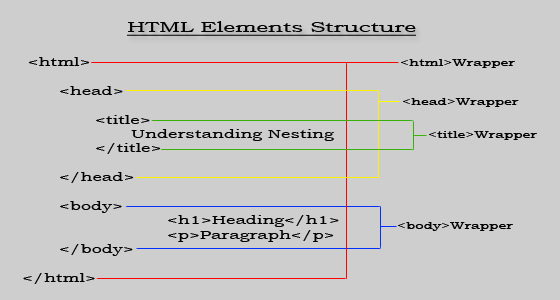 Take a look at the HTML Elements structure diagram above for an easy understanding of an HTML nesting structuring. It explains the above tutorial visualized. Nesting is a bit complicated construction, but if you understand the parents, children, siblings principle you'll get to understand this easily.